Inside Youth Sports: Should a Parent be a Coach? 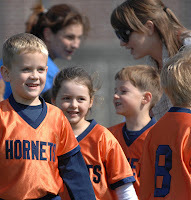 Here's a guest post from Mike Mancini, a parent and coach who writes about youth sports. Mike brings his parental perspective to the sometimes sensitive situation involving a parent who coaches his or her child. You may also want to check out my post on this topic: The Coach's Kid Always Plays. As long as there have been sports around, there have been parents who have coached their children. As parents, we have heard the rallying cry from our sports administrators – “Get Involved!”. Some parents partake of that message in different ways. For example, some may put time in working the concession stand, while others take it upon themselves to spearhead the fundraising activities, while others take the plunge and coach. Coaching your child is a delicate balance, even for those of us who believe we are the most objective folks to ever walk the good earth. At times, fair or unfair, perception plays a larger role in this situation than in a “normal” coach – player relationship. That relationship at times comes into play as a matter of course. The high school varsity baseball coach who coaches their child while the child is in high school, is one example. A number of other parents volunteer to coach, generally because their child is in that sport. Many will follow their child to various age levels, as well. In either circumstance, however, it still becomes a gentle dance of tact, professionalism, and objectivity. Know your sport – This seems rather obvious on the surface, but for some, I think it may not be evident. A parent may be so excited about coaching their child that they lose sight of the fact that they do not have the proper expertise to do it. I have seen this come into play with my daughter and nephews in various sports. Well-meaning parents are out there ‘coaching’, when all that happens is a glorified babysitting, back slapping, snack chomping session. If the sport is organized, there should be teaching going on at each practice and game. If you do not have the expertise to be able to actually teach the sport, your help is best served off of the field and not on it. Even if you feel you know the game, ask yourself if you can teach the proper, age appropriate techniques for your sport. If you cannot honestly answer “Yes” to that question, than look for other ways you can help. Be Objective – Again, here is what is perceived as an obvious point, but it becomes even more important if you are coaching your child. Are you, as a coach, willing to do what is best for all at all times? I’ve seen some coaches in this situation overextend themselves on either side of the coin. Some coaches come down extremely hard on their child, to make sure everyone can see that they are not being overly persuaded by their kid. That can take a toll on the child. My brother-in-law coaches his kids in baseball. I’ve seen (and heard!) many discussions between he and my sister on that very topic. While thinking he’s showing his impartiality, from another observer he may be coming down more than he probably would normally do on his own kids. Of course, I have been a part of the opposite scenario, as well. The coach plays his child at enviable positions and for a greater time periods than others. These are well meaning coaches, as well. However, since they know their child better than anyone else, they give them the extra added benefit of the doubt, if you will, and honestly have a different perception of the child’s skill level. In either case, I have found that the best suggestion is to ask for feedback from a key observer, or two. Do not open it up for all, or you’re going to get bombarded with comments and go through too much ‘analysis by paralyses. Pick out one or two key folks that you trust to give you some honest feedback on a regular basis. This can help in creating as objective of an atmosphere, as possible. Coaching is a tough and challenging calling. The coach has the responsibility of teaching and guiding a number of players on a team, not only individually, but also bringing those individuals together to meet a desired goal. That is a daunting task in and of itself, let alone adding on the focus of being the parent, as well. It can be quite rewarding for sure, but be thorough in your focus, thinking processes and preparation before coaching your child. Hey Mike. Good to hear from you on this blog. The parent-coach thing is such a tough situation. In many places administrators of clubs and leagues are beating the bushes for any willing and (somewhat-) able bodied people to serve as coaches. Well- intentioned folks step up and do what they can. Very few of these, I have found, will take advantage of the training that's out there for coaches. Often clubs will even pay for coaches to do it. Coaches need to do this. There is way more to coaching than knowing the positions and something about the game. 2. Let your child experience other coaches and other coaching styles. Many dedicated parent-coaches I know will tell you they waited too long to give up the reins. I love the idea of having the assistant work with the child a little more. Makes a lot of sense and wish more coaches would do this. It has been great to see more organizations open up training, or at least a mentoring program, for coaches in this situation. However, it does seem to be the exception rather than the norm to take advantage of these very worthwhile programs.